Schlitz may be the beer that made Milwaukee famous, but recently the spotlight has been shining on the city’s school choice efforts. Back in 1990, the Pleistocene Era of education reform, the Milwaukee Parental Choice Program became the nation’s first publicly funded school choice program for low-income children. Born of an interesting political marriage – Democratic state legislator Polly Williams and Republican Governor Tommy Thompson – the program started as a way to address the city’s troubled education system. See what research says about the relationship between vouchers and student achievement… Americans want consistent standards for students. Where vouchers are in place — Milwaukee, Cleveland, and Florida — a two-tiered system has been set up that holds students in public and private schools to different standards. graduated from high school and both enrolled and persisted in four-year colleges at rates that were four to seven percentage points higher than a carefully matched set of students in Milwaukee Public Schools. Using the most conservative 4% voucher advantage from our study, that means that the 801 students in ninth grade in the voucher program in 2006 included 32 extra graduates who wouldn’t have completed high school and gone to college if they had instead been required to attend MPS. 82 percent of 9th grade students in voucher schools graduated from high school, while just 70 percent of 9th graders in the Milwaukee Public Schools did. Both systems have seen a marked increase in high school graduation rates since 2005. For the Milwaukee Public Schools, the rate has moved steadily upward from 54% in 2005 to 57% the next year, then to 60%, then up, again, to 65%, and, finally. to 70% in 2009, a healthy trend that that should be applauded. So not only do vouchers help those who use them, but they also seem to positively affect those students who stay in their traditional public schools. One private school that primarily serves low-income students through Milwaukee’s Parental Choice Program boasts a 100 percent college acceptance record. In most schools, a percentage of the graduates would be heading off to college, while many would have a different destination. But Hamilton and all 36 of his classmates have been accepted to college. It’s the second year in a row that one hundred percent of HOPE Christian seniors gained college admission. Many of the graduates will be the first in their families to graduate from high school and attend college. In Milwaukee, vouchers are saving the taxpayers money. The per-pupil taxpayer cost of independent charters and the MPCP is substantially less than that of the Milwaukee Public Schools (MPS). In 2011-12, MPS per pupil taxpayer cost was $13,269, which is made up of state, local, and federal aid compared to $7,775 for independent charters and a maximum of $6,442 combined state and local aid for MPCP. The MPS per pupil taxpayer cost is calculated using information from the MPS budget. The MPCP per pupil funding is from the Legislative Fiscal Bureau Informational Paper on the Milwaukee Parental Choice Program. Never knowing when to quit, NEA recently posted an article about Barbara Miner, who just wrote a book about Milwaukee called Lessons from the Heartland: A Turbulent Half-Century of Public Education in an Iconic American City. Miner, who is mordantly attached to the status quo and quite enthusiastic about it, is associated with Rethinking Schools, an organization that believes real education reform will be led by the teachers unions. (No, this is not an early April Fool’s joke.) In 2011, this “social justice” outfit held a conference where its keynote speaker was unrepentant terrorist Bill Ayers. 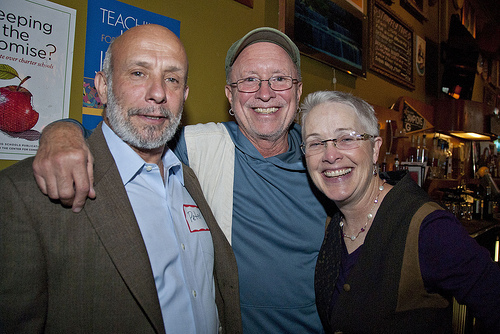 (Here we see a photo of chums, Ayers and Miner, at the event.) NEA ends the article with a direct quote from Miner, who leaves no doubt about her values as she unloads on Wisconsin’s pro-choice governor Scott Walker. We survived Joe McCarthy. We will survive Scott Walker. Apparently, in Miner’s eyes, Walker is an evil demagogue because he championed the move to get the government out of the union-dues-collection business, and has the audacity to care more about kids and taxpayers than ensuring that big bucks flow to union coffers. …51 percent of Wisconsin voters support a major expansion of the state’s private school choice program. The Marquette poll reported that 37 percent of Wisconsin voters would support a statewide expansion of the program while another 14 percent would support its expansion to large school districts with some failing schools. In contrast, 14 percent of voters say they favor not expanding the program, while 28 percent would end it.